Obama actually received a bump among independents while Romney’s support remained flat. 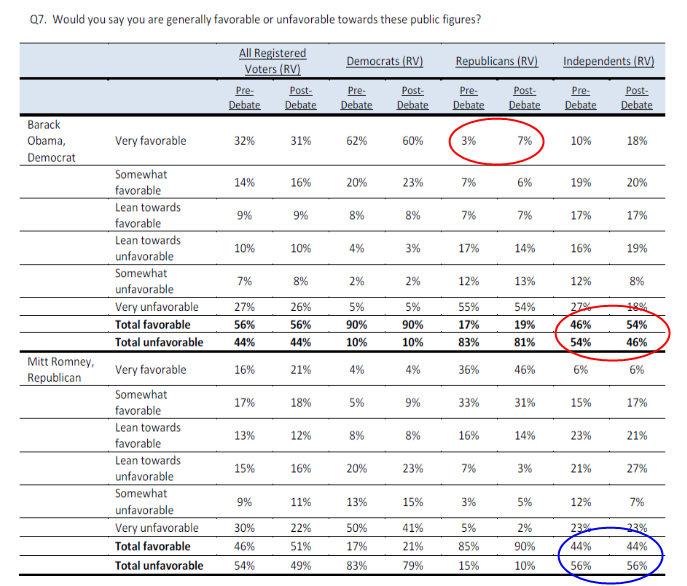 The President even saw a rise in favorability among Republicans, negligible as it may be. Given the surge in independent voter registration in battleground states, this could become an advantage for the President especially he improves his performance in subsequent debates. Nice catch here. Let’s see if this is an anomaly or a trend. Slayer> Yeah I hope it does. Very good gain, in a very important group. Flipping the numbers like that can only be a good thing for the president. Chris> Yeah I would think so… hopefully it holds. And with the good news from the jobs report, it may very well stick. Less than a month to go until the start of Campaign 2016! Woo hoo!!! !